This is so easy – I really was surprised. I let this cook in the oven while I was running around finishing dinner, getting ready, and cleaning up before some friends came over for dinner. It comes out tasting like a creamy caramel. 2. Bake it for 1 hour to 1 1/4 hours. Check it about every 20 minutes and add more water. If you leave it in for the full 1hr 15 min, you’ll get a darker brown caramel. 3. After an hour or hour and a quarter, pull out the roasting pan and just let the whole thing sit for a few more minutes. There’s no need to take it out immediately; it won’t burn. I prefer doing this so that I don’t burn myself with hot water. Pull off the foil and admire the color. Congratulate yourself on making this so easily instead of buying a bottle of it from the store. 5. 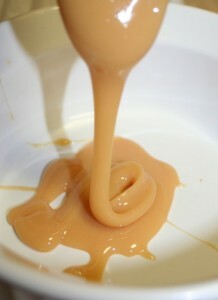 Pour the caramel into a bowl, using a spatula to scrape down the pie plate. Whisk it up to smooth out the small lumps. If you do this while it’s still hot, they’ll blend in. 6. Let it cool to room temp. It’s still liquidy while it’s hot, but once it cools down, it’s thick and oooey gooey. Store in the fridge. When you take it out, it will be a little solid, so just microwave it to get it soft again. I used it to make David Lebovitz’s Dulce de Leche Brownies using the last of the chocolate bars people gave us as wedding gifts (great gifts, by the way). I now call them The Devil’s Brownies. I’m glad I made them for friends (and then gave half of the leftovers to Maryam) because Ameir and I are on a health kick and I would have eaten all of the brownies. I also stirred a couple spoonfulls of the leftover dulce de leche into my coffee (take that chi-chi coffeeshops). Delish. Update: I couldn’t get enough of this stuff so I had to come up with something else to do with it. Try this Dulce de Leche Pear Tart.